Home > Printable Coupons > New Glade Expressions Coupon = Free at Walgreens! New Glade Expressions Coupon = Free at Walgreens! There is a great new coupon this morning that makes for an easy freebie at Walgreens right now!! 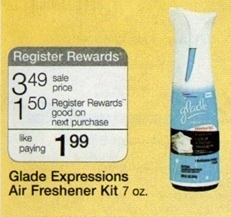 Get this $2 off Glade Expressions Air Freshener Kit coupon. Then head to your store. That makes it FREE after the Register Reward! See all the deals at Walgreens this week.